Are you thinking about investing in a new mattress? Want a plush top layer but unsure about the difference between a Euro top and a pillow top mattress? We can help! The BedStory 10-Inch Euro Top Latex Hybrid is an antimicrobial bed with a latex layer that helps protect your mattress against bacteria, dust mites, and other allergens. It has a balanced level of firmness and softness, which makes it suitable for back, stomach, and side sleepers. Euro Top vs. Pillow Top – What’s the Difference? If you want to go for a Euro top mattress, we recommend the BedStory 10-Inch Latex Hybrid, which has a hypoallergenic design and sleeps cool. Our favorite pillow top mattress is the Modway Ultimate Quilted Pillow Top Mattress, which uses two foam layers for comfort and pressure relief. Different types of mattresses come with different contouring abilities and comfort qualities. The top layer, also called the comfort layer, may have synthetic down filling or memory foam layers stitched into it for a plush feel. The quality of this layer will depend on the design of the mattress and the type of feel the manufacturers want to bring to the sleeper. While the Euro or pillow top is only a small part of the mattress, it can make a big difference in how the bed feels, overall. Pillow tops and Euro tops are two popular types of mattress top layers and they provide different comfort levels. We’ll start with the differences between these two types of beds and cover some top options in both styles. A pillow top layer is stitched over the top layer of the mattress with a slight gap between them, giving the top of the mattress a pillow-like feel. A Euro top is stitched over the top layer of the mattress without a gap. Both pillow tops and Euro tops can be made of either fiberfill material or foam. With a pillow top, the pillow can be distinctly seen as an additional section of the bed, whereas a Euro top appears uniformly stacked. A pillow top mattress provides a firm feeling with a uniform cushion throughout the bed, whereas a Euro top layer is soft in the middle and tends to be firmer at the edges. Both pillow top and Euro tops come in all standard mattresses sizes (Twin, Full, Queen, and King). With most mattresses, though, the pillow top may make the mattress taller and might require larger sheets than a Euro top mattress. This is because of the extra space in the pillow top, which makes it look bigger than a Euro top mattress. The main difference in effect between a pillow top and Euro top is the balance in the top layer of the bed. A pillow top is designed to create a plush effect that you feel throughout the surface of the mattress. There’s typically a balance of cushion with no notable difference between the sides and center of the bed. With a Euro top, on the other hand, the mattress may feel plusher in the middle with a firmer feeling on the sides. 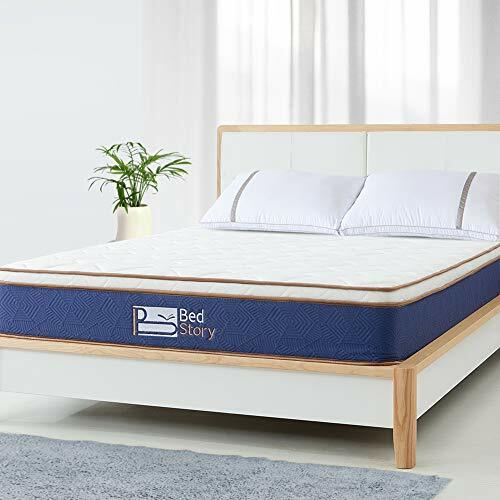 The Sealy Responsive Premium Euro Top Mattress is a plush bed with a 3-inch foam Euro top and an encased coil system. The luxurious design has extra support under the hips to keep your spine in proper alignment as you sleep. It uses a proprietary Cooling Gel Memory Foam to help you rest at a comfortable temperature. The cover both protects the bed from common allergens and wicks moisture away from the body to keep you cool. The edges of the mattress are supported with a flexible, dense coil border, making the bed more durable. Made in the USA, the Sealy Responsive Premium Euro Top Mattress comes with a 10-year warranty. The Oliver Smith Plush Euro Top Mattress is a very affordable bed with a 100 percent natural organic cover. It uses ventilated cooling memory foam to help pull heat away from your body while you sleep. The bed uses independently pocketed coils and the Euro top adds a plush, comfortable feel that could help back pain sufferers. 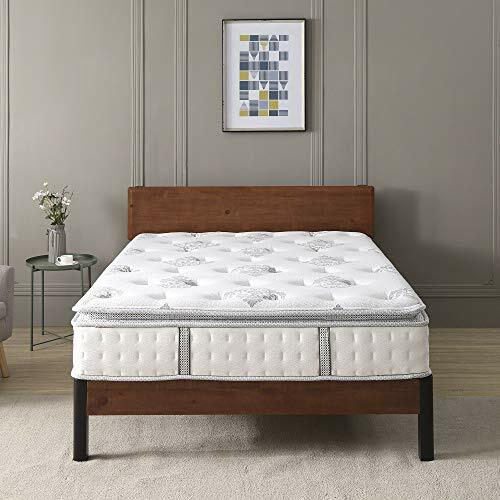 The Oliver Smith Plush Euro Top Mattress is made from durable materials and maintains its shape over time. The bed comes in a box which makes it easy to transport and set up. You should give the bed at least 48 hours to expand to its full size. Some sleepers may notice a slight chemical smell when they first un-package the bed, but this should dissipate quickly. To get warranty information for the Oliver Smith Plush Euro Top Mattress, contact customer service at Amazon. It uses independently encased coils which prevents the springs from making noise and also helps to prevent motion transfer. This feature makes the bed suitable for people with partners or pets. The knit mattress cover dries quickly and absorbs moisture, promoting airflow and helping your body breathe. The bed comes rolled and compressed in a box, so it will take up to 72 hours to expand to its full size. The BedStory 10-Inch Euro Top Latex Hybrid comes with a 10-year warranty to protect your purchase. The Modway Ultimate Quilted Pillow Top Mattress is an innerspring bed that uses individually wrapped coils to prevent motion transfer. If you share your bed with a partner, you shouldn’t disturb each other when you move around in bed. Comfortable for stomach, back, and side sleeping, the bed uses two foam layers for plush comfort. The quilted pillow top surface helps relieve pressure in the shoulders, back, and hips, while the firm coil base prevents the mattress from sagging. The Modway Ultimate Quilted Pillow Top Mattress comes compressed in a box for convenient delivery and set up and may need up to 24 hours to expand to its full size. The mattress comes with a one-year warranty to protect customers from manufacturing defects. 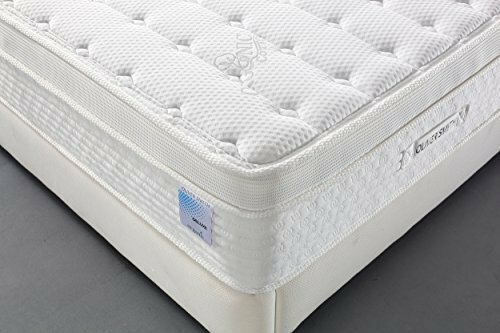 The Mattress America Frost Pillow Top Mattress uses both coils and memory foam in its construction. 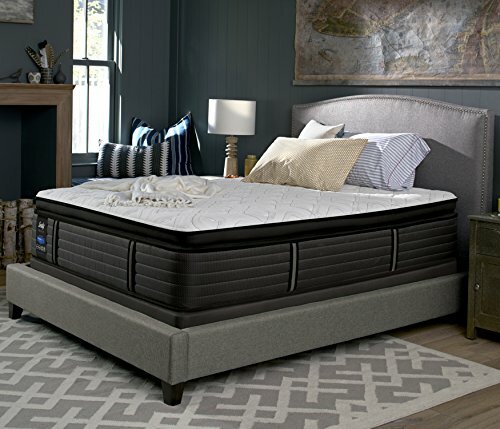 The memory foam is infused with cooling gel to help you rest at a comfortable temperature, while the coils promote airflow to prevent heat buildup. This mattress uses a thick, durable cover with a soft feel and a breathable design to further encourage a cool sleep experience. 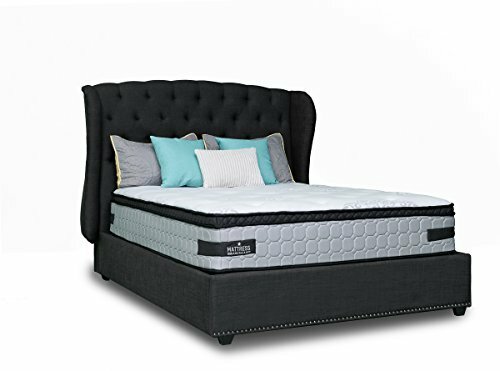 The memory foam in the Mattress America Frost Pillow Top Mattress creates some cradling sinkage while the coil core provides firm support. The bed has enhanced edges and lumbar support, so if you suffer from back pain, this could help. The Mattress America Frost Pillow Top Mattress comes with a 25-year warranty, which is unusually long for this type of mattress. The Classic Brands Mercer Pillow Top Hybrid combines wrapped coils with gel memory foam to create a supportive, pressure-relieving sleep surface. The gel-infused foam helps to pull heat from your body to keep you resting at a cool temperature. This bed should be suitable for partners since the coils move independently, which limits motion transfer. The quilted pillow top cover on the Classic Brands Mercer Pillow Top Hybrid has a knit design for breathability, so you don’t overheat while you sleep. The bed ships in a box for easy setup and delivery, but note that there may be a slight off-gassing odor when you first open the box. Leave the mattress in a well-ventilated room for 48 hours to help the smell dissipate. The mattress comes with a 10-year warranty. The size of your mattress will impact how it fits in your existing bed frame. Both pillow top and Euro top mattresses provide you with plush comfort. But a pillow top mattress will require slightly larger sheets to account for the extra height from the additional space between the layers mentioned earlier. Make sure you’re buying sheets that are deep enough to accommodate this extra height and that your bed frame is the right size for it, too. According to user experience, pillow top mattresses have a shorter lifespan than Euro top mattresses because of the gap between the pillow top and the top layer of the mattress. This gap typically lessens as time goes on and the top layer begins to sink in, decreasing the plush effect initially found. With a Euro top, on the other hand, that cushioning effect tends to last longer. As a Euro top bed nears the end of its lifespan, the edges may start sagging while the center retains can retain its comfort level for longer. When it comes to the cost of each mattress type, there’s not much of a difference. While cost and inner material quality can vary between mattress companies, the average price range is about the same. What will impact the price of your pillow or Euro top mattress most is the quality of the base layer, springs, or foam used in the bed. The top layer will only play a small role in how much the mattress ends up costing. Sleep temperature is an important factor when it comes to the quality of rest you’ll get night after night. Hot air can accumulate in your mattress while you sleep, causing your body temperature to rise and disrupting your rest. In order to address this common issue, mattress manufacturers typically include cooling technology in their products. When comparing the sleeping temperature of a pillow top and Euro top mattress, a pillow top will typically sleep cooler than a Euro top, as the extra space between the pillow top and comfort layer of the mattress helps disperse heat and promote airflow. All in all, pillow top and Euro top mattresses feel very similar with only slight differences. Euro top mattresses do tend to maintain their plush comfort level for a bit longer, so keep that in mind before you buy.